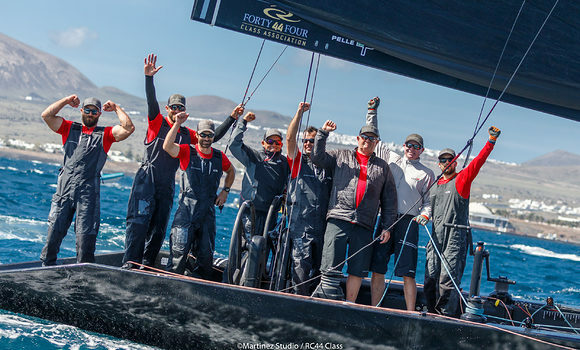 Puerto Calero – Nico Poons’ Charisma proved today that there is a new player in town in the one design fleet, as they clung on to their lead from yesterday to win the RC44 Calero Marinas Cup, the opening event of the 2018 RC44 championship. But it came down to the last run of today’s last race when a final curved ball cut the Monaco-based team’s overall lead to just one point ahead of arch-rival, Team Nika. With no awkward frontal systems to complicate matters today, Lanzarote reverted to her usual summery self for the final day of competition. Until the last run the winds remained reliably in the southwest at around 15-16 knots, which with flat water and a scorching sun that made it seem like June in the Mediterranean. After posting a couple of deep results, Vladimir Prosikhin ‘s Team Nika was back on song for race two. The Russian team and John Bassadone’s Peninsula Petroleum opted early for the right on the first beat where they struck gold. The two boats were respectively first and second at the top mark, positions they maintained until the finish. In the third and final race it was for the first time Hugues Lepic’s Aleph Racing, steered here by former Farr 40 World Champion, Jim Richardson that rounded the top mark in first. However on the run Torbjörn Törnqvist’s Artemis Racing overhauled the French team and went on to lead for the remainder of the race. However this was despite an almighty right hand shift on the final leg that forced those on port gybe to finish under jib. Despite a disappointing fifth place for Nico Poons’ Charisma in the final race, this was still enough to secure her first RC44 regatta victory in four years, just ahead of Team Nika. Team CEEREF made the best of the final dramatic shift to finish third leaving her third overall, three points behind Team Nika. Competition now returns to Portoroz, Slovenia, birthplace of the Russell Coutts-inspired RC44 for the second event of the 2018 championship.